Oops - we don't appear to have a video for the Scanjet Pro 3000 s3. Produce scans at up to 35 ppm/70 ipm1 with two-sided scanning that captures both sides at once. Capture every page easily – even stacks of mixed media – with HP EveryPage and an ultrasonic sensor.3 Free up space for work. 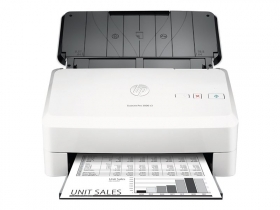 This HP ScanJet Pro is small and slim – a modern design perfect for the desktop. Handle paper from 40 gsm (11 lb.) to 413 gsm (110 lb.) weight and up to 21.6 x 309.9 cm (8.5 x 122 inches). Streamline routine work with one-touch scanning – create one-button, custom settings for recurring scan jobs. Scan images directly into applications with included and full-featured TWAIN and ISIS®. Easily transfer scans into editable text, secure PDF files, and more file types, using built-in OCR. Quickly share or archive scans directly to popular cloud destinations with HP Scan software. Define scan profiles for common document types, and scan to multiple destinations with HP Scan software. Scan directly to mobile devices with the HP JetAdvantage Capture App, using the optional wireless accessory, and then edit and save files.2 Capture and organise documents, business cards, and other file types with feature-rich software.